Here at the Bengal Cat Den, we feed our cats a low carb, high protein diet. Their dry food is grain free, and their canned food adds needed moisture to their diet. A Bengal should never be placed on an all dry kibble daily diet. Though it is more convenient to the owner to feed this way, Bengals need moisture in their systems and high quality canned food aids digestion. I do not hesitate to customize some of our cat’s diets. I have a couple of cats that crave more protein than our other Bengals. Therefore, I feed them some cooked chicken, a bit of canned tuna in water, or scrambled eggs, along with their grain free kibbles and canned food. Some of my Bengals love home made chicken broth or a bit of kitten formula as an added treat. We encourage Bengal owners to keep the cats on food they are accustomed to eating. If they decide to change to a label of their preference, the change of food must be done gradually to avoid stomach upset and loose stools in the kittens. We suggest a slow change over a period of 2 weeks. When a Bengal kitten is being placed in its new home, it is good to initially acclimate the newcomer in a confined area, such as a spare bedroom. By doing this, the kitten grows accustomed to the smells, sights, and sounds of its new family, without feeling threatened by the vast area of space that an entire house can have. The kitten needs to get used to the location of its litter box and food dishes, before having the run of an entire house where much busyness can distract. Usually within a week, the cat is confident enough to journey out of the room and explore other areas. The kitten can slowly be integrated into the family activities. 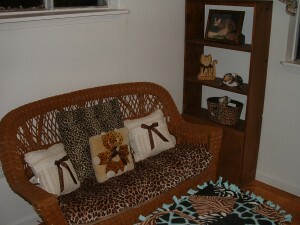 Give the new feline easy access to its litter box and food area. It’s a good idea to keep using the same brand of litter that your kitten was trained on with the breeder. They get used to certain textures and smells that manufacturers place in their special litter formulas. If you choose to use a totally different brand, texture, and formula of litter, the kitten may get disoriented enough that he will be hesitant to use the litter box. If you are a multi-cat household, it is imperative to start your new kitten in his own individual litter box. The stress of having to share a box with strange cats (that may be intimidating to a small kitten) is too much to adjust to right away. Also, cats can be possessive of their litter box and may chase the new kitten from it. Give all of your cats several weeks to get used to the newcomer before having them share any litter boxes. The kittens from the Bengal Cat Den are sent home with two sets of kitten boosters completed. It is the new owner’s responsibility to follow up with a vet of their choice for rabies boosters and spay/neuters. All of our kittens are professionally vet checked before leaving TheBengalCatDen. 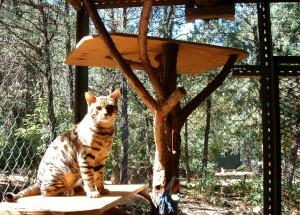 All of our Bengals have a one year health guarantee for congenital, life threatening defects. If you have purchased a kitten from the Bengal Cat Den as a “pet quality” kitten, then you are responsible to have the kitten spay or neutered by 6 months of age. We have seen through experience that some of the cleanest, nicest, house cats are male Bengals that were neutered by 6 months of age. Their hormones have not become aggressive enough before this time to cause them to “mark their territory.” Inevitably, the only complaints I have gotten on male Bengals “spraying” in their home, have been from owners who have let too much time slip by and neglected to neuter their cat by 6 months. Female kittens will also “mark their territory” if they are not spay by 6 months of age. Females also get natural hormones starting to arise that will cause them to “claim their territory.” Rule of thumb is: Never let your kitten go beyond 6 months old before spaying and neutering. If you are a breeder, you have expectations on how the cats are to be housed and maintained. An affective breeding program first starts with happy and healthy cats. No one with an unaltered Bengal should expect the cat to live in the home and have superb house manners. Their instinct will cause them to spray and mark their territory. It is unfair to the cat for us to demand higher expectations. There are certain instinctual behaviors a cat follows. They are cats not people! House your unaltered cats in adequate space where they can get plenty of exercise. 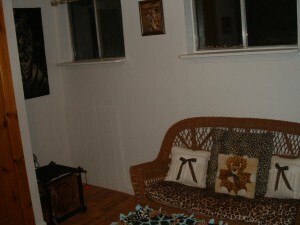 Spaces should be 200-300 square feet per cat. They must be heated, air-conditioned, and made in a way that the cat is not susceptible to predators. They must be built in a way to be totally washable and easily disinfected. 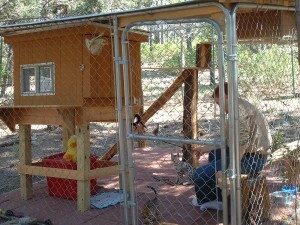 The areas should be interactive with toys, jungle gymns, stainless steel food dishes and clean bedding. 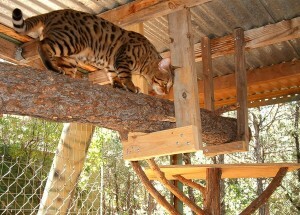 Cages are unacceptable living standards for a Bengal cat. They deserve much better. Cleanliness should be priority number one. Breeder cats should not be presented for breeding purposes until they are at least one year old. Before one year of age, their bodies are not matured. More health issues arise when too young of a female is presented for breeding. There can be difficulties in labor with drastic measures taken to save a litter. Give her time to grow up, then she will make a fine mother cat. 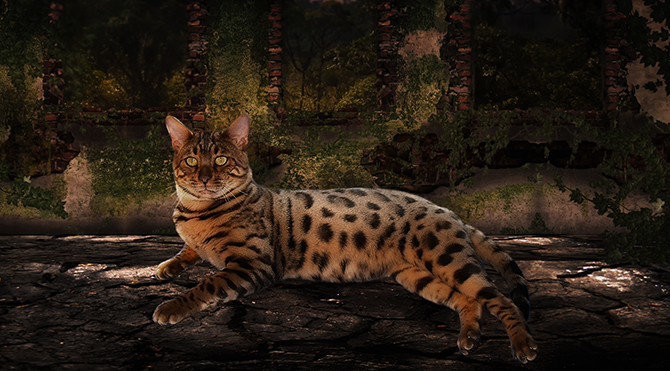 Last, but not least, when you purchase a Bengal from the Bengal Cat Den, be aware that the cat must stay indoors. If your Bengal goes outside, it can find a way of escape because Bengals are acrobats and high jumpers. After the cat escapes the safety of the home, it becomes prey to the neighborhood dog, or the new pet for a person 2 blocks away that always wanted a Bengal. Remember: Cats are independent creatures. Do not fool yourself into thinking that if you let it out “just this once” that your Bengal will come back when you call it! They are cats, not dogs, and have an independent demeanor. Keep your beautiful cat indoors! It will add years to its life! 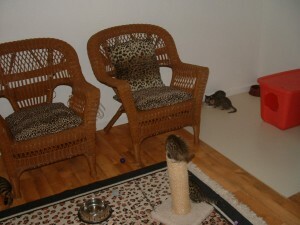 Please enjoy some examples of areas that we have made for our Breeder Bengal Cats. 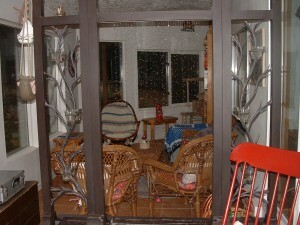 We spend much time building positive, interactive areas, that are heated in winter and cooled in the summer. 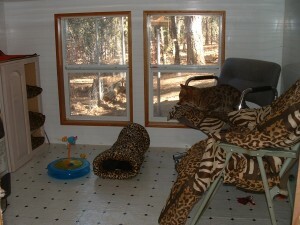 They provide our beautiful cats with adequate shelter, lots of sunshine, and plenty of novelties to climb and play on. 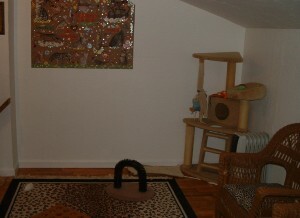 “The kitten nursery at TheBengalCatDen. able to see by pictures and information what TheBengalCatDen is all about. feel that shipping young kittens is too traumatizing to young fur babies. Any questions? Email me and I will write back. Thank you! of our cats here at TheBengalCatDen.